Here's a golden opportunity to put Shure's legendary microphone sound and performance in your hands - for an amazingly low price! 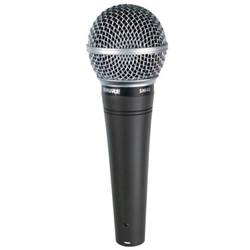 The SM48 gives you the outstanding sound and durability that Shure mics are renowned for. Its cardioid pickup pattern helps keep outside sound sources at bay and fight off pesky feedback. Handling noise is not a problem, thanks to the SM48's shockmounted cartridge. You'll also appreciate the built-in pop filter. This mic is perfect for live vocals, but you'll also love how it sound on other sources. Plug in the SM48 and you won't believe what an astounding value you're getting!